Thanks for sharing your video and welcome to CARM. I believe it might be Mars. The 12x zoom does not increase resolution but a white "band" on the lower part of the spherical object is visible. Interestingly, Mars' closest approach is on July 31st. You might want to get your camera out an take another video -if the sky permits good viewing- and make a comparison. On July 20th, the moon's phase was in its first quarter, Mars, Saturn, and Jupiter were very bright objects in the sky, and observations of Mars' surface are obstructed by a current giant dust storm, but the south pole's carbon dioxide ice cap is still visible and I believe that I might be viewing it on your video since cameras usually produce an upright image. Last edited by inertia; 07-29-18, 07:01 PM. Thanks again for your feedback. If it is Mars, then it's the result of God's sound waves. God bless. Thanks for your response. I can see the white at the bottom but it also extends up the right side as well...snip.. Even here the carbon dioxide south pole is visible even though optical aberrations and a dust storm greatly affect surface resolution. It's clearly a blurry photograph. 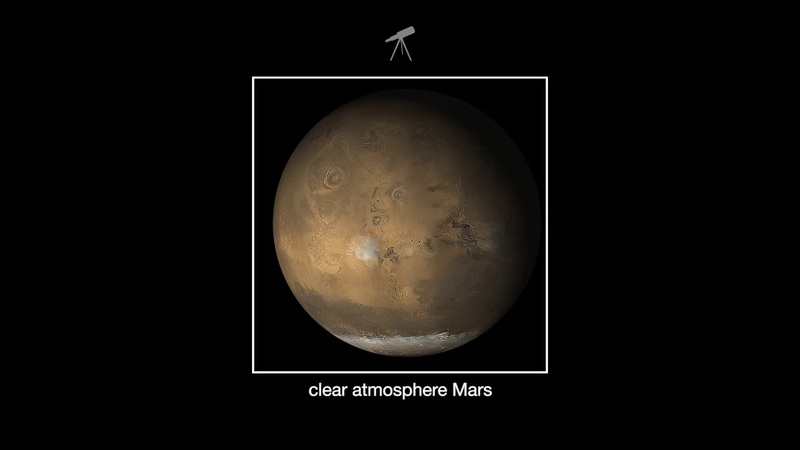 If your photograph is of Mars, a smaller diameter camera aperture using commercial-grade optics would provide an image with even less resolution. ...<snip>..Someone suggested that image might be the result of sound. I never heard of this before, but sound can make patterns. There is a photo of images that were made with piano notes on aloe vera gel. I could see the circular band around these that is similar to the ones in my photo...<snip>.. It's true that sound waves travel in air. When supersonic aircraft such as the SR-71 or a rocket travel at supersonic velocity, shock waves can be seen for miles around with an audible double bang. The optical aberrations seen in your video do not look like shock waves to me. Astigmatism and spherical aberration as well as atmospheric turbulence are a more likely source of poor image resolution. Any physical sound waves produced during God's creation of planets would have long dissipated. If the image is one of Mars from your camera, the ring you are describing are likely due to optical aberrations. NASA has access to space and land-based telescopes that have very large apertures and optics polished to a fraction of the wavelength of visible light, and some even have adaptive optics to correct for atmospheric turbulence to produce very, very high quality images. ...<snip>..I think they retouch everything on Photoshop to match the public's expectations of what the planet should look like...<snip>..
You are right, but when they retouch, they inform everyone. Professionalism is required. I'm wondering how one can quantify "the power of intention" with physical harmonics? May God bless you too, Cafe Word. Last edited by inertia; 07-31-18, 12:09 AM. From what I've heard one the news, this month Mars' orbit is close to the Earth. Thank you. It's interesting. We are all made up of frequencies, I learned. They are also developing frequency weapons, which is scary. That 5g stuff isn't healthy for our frequencies either. They need to do more research before they roll this stuff out on us. Thanks again.